Liz Rognes had always been both a musician and a creative writer, and when her grad school prospects in music composition weren't coming together, she threw caution to the wind and moved to Spokane from Minnesota for EWU's writing program. That was 10 years ago, and she quickly realized "I couldn't not write songs. I couldn't not perform," and Rognes starting playing open mics at the Empyrean and other long-gone Spokane venues. She also toured the region as a solo artist — often literally by herself — and was always relieved on the too-rare occasions she ran into women in prominent positions at the clubs she played. "I've had so many experiences with sexism and creepy men in clubs," Rognes says. "I think if there's a woman club owner or booker, or a woman running sound, they're aware of your experiences as a woman performer. I don't want to make any huge generalizations about gender, but I do think it's different." Considering the landscape of Spokane clubs in 2019 versus 2009, Rognes has the sense that there's more stability today. "When I first moved here, it seemed like every time I would fall in love with a venue, it would close," she says. There are also a lot more women owning clubs and promoting shows than there used to be, and that's nothing but encouraging. "It's important to see women doing those jobs because it shows all of us it's possible for women to be in positions of authority in the music scene," Rognes says. For the past five years, Rognes has been working to show young women, girls and nonbinary kids that the barriers between them and participating in music at all levels are there to be knocked down. 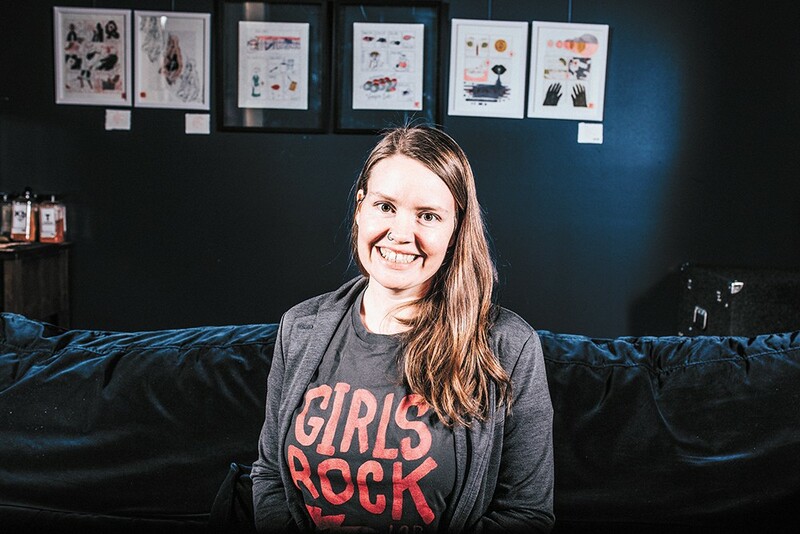 She co-founded the Girls Rock Lab in 2014 along with a pack of Spokane musicians and supporters, inspired by the Rock 'n' Roll Camp for Girls movement. "A bunch of musicians all got together at Atticus and talked about how we could do it," Rognes says. "It was a very DIY operation. Everyone brought their own instruments, we shared gear, we just made it happen." The Girls Rock Lab was a hit from the start, with registration filling up fast that first year. Now operated through the local nonprofit Spark Central with an assist from Spokane Public Library, the lab functions two weeks each summer, and offers some valuable lessons to its students from a wide range of local musicians. Each week of the lab, 15 to 20 young preteen and teenage young women form bands, learn instruments and songs, and ultimately perform a show at week's end, typically on a local venue stage like the Bartlett, and often alongside bands led by their Girls Rock Lab teachers. "There are so many barriers to participating in music, and I mean that in terms of music in a local rock scene, folk, jazz, classical, kind of across the board," Rognes says. "At a young age, girls aren't necessarily encouraged to play loud instruments, drums or amplified instruments. We wanted to create a space where girls can come and be loud and make music and be creative and be empowered and be taken seriously. "It's not just about music, either. It's about empowering girls, about inviting them and showing them that they are valued and giving them a place where their voices are heard. Then they get to see women from the community working to put this camp on, and I think that's huge." The original print version of this article was headlined "LIZ ROGNES"